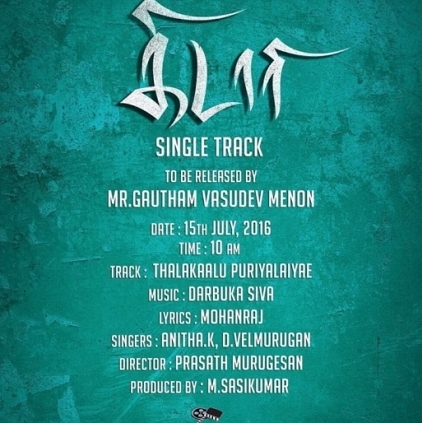 The shooting of Sasikumar’s Kidari is complete and the team plans to release a single tomorrow, the 15th July. This will be done by director Gautham Menon. Darbuka Siva is making his debut as a music composer in Kidari. Earlier on Gautham Menon had appreciated the single in his social media page, “I liked what I heard. A new sound in music. Sasikumar's Kidari with music by Darbuka Siva. Welcome Siva”. We talked to Siva to get his feel on this and he elaborates, “Yes, we had an exclusive listen session for Gautham Menon sir. He listened to the single ‘Thala Kaalu Purila’ that he is going to release tomorrow. He liked and appreciated. I am happy and excited. I never planned to enter films and the whole thing is a surprise for me. I am glad that I got to work with a very passionate team. There are seven songs in the album. We only went for the sounds needed for a particular situation in the script and did not confine ourselves to adhering to one genre per song. This is how I approached the album. But you will find different styles which are organically blended in each song. The album release date will soon be announced”. We wish you the best Darbuka Siva and Team Kidari! People looking for online information on Darbuka Siva, Gautham Menon, Kidari, Sasikumar will find this news story useful.